This large and diverse group of phototrophic and hetero-trophic organisms is characterized by motile cells that typically have two unequal flagella, that is, a forwardly directed tinsel flagellum and posterior directed whiplash flagellum. The tinsel flagellum is covered with lateral bristles (mastigo-nemes), whereas the posterior flagellum is smooth and usually shorter or sometimes reduced to a basal body (Lee, 1999). All are golden or brown in color and several classes are generally recognized, including the Synurophyceae, Pelagophyceae, Raphidiophyceae (chloromonads), Eustigmatophyceae, Chrysophyceae (golden algae), Bacillariophyceae (diatoms), Dictyochophyceae (silicoflagellates), Xanthophyceae (yellow-green algae), and Phaeophyceae (brown algae). We will cover only the last four groups here. occurring in environments that include freshwater, brackish, terrestrial, subaerial, and marine habitats (Round et al., 1990; Hausmann et al., 2003). They are an important part of the marine phytoplankton and, as primary producers, are estimated to fix at least one-quarter of the inorganic carbon fixed in the ocean (Granum et al., 2005). Many are planktonic, but they also occur as epiphytes on, or endophytes in, other organisms. 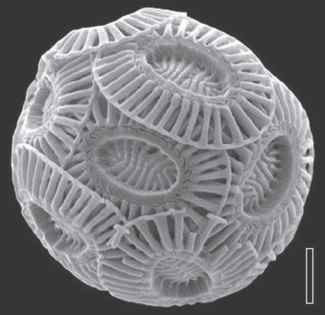 Diatoms are constructed of a cell enclosed by a rigid, cell wall or shell (FIG. 4.39) composed of opaline silica (silicon dioxide, SiO2) coated by an organic material. This shell or frustule is constructed much like a Petri dish or a box in that one valve fits inside the other valve, and it is the reason that the fossil record of diatoms is so excellent. When a diatom cell dies, the frustule separates into two parts which settle to the bottom. Deposits of fossil diatoms, termed diatomaceous earth, may be more than a thousand feet thick in some areas of the world, for example, in Lompoc, California, where diatomaceous earth is mined and has several commercial uses, as an abrasive or in filtration. Frustule shape and elaborate ornamentation are two of the important characters used to classify fossil diatoms. Two of the most common shapes are centric (radial) and pennate. The fossil record of the diatoms is extensive and can be traced into the Mesozoic (Sims et al., 2006). 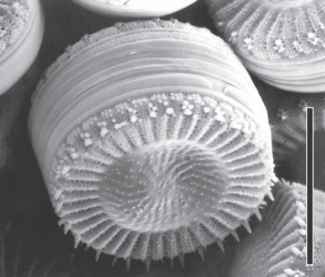 The earliest unambiguous marine diatoms are known from the Lower Jurassic (Rothpletz, 1896; Barron, 1987), and the earliest diverse diatom assemblages occur in the Lower Cretaceous. Molecular clock hypotheses, however, suggest an earlier origin of the group (Kooistra et al., 2003). Medlin et al. (1997) suggested that the origin of diatoms may be related to the end-Permian (~250Ma) extinction event, after which there were presumably many marine niches available. The oldest fossil freshwater diatoms to date are latest Cretaceous (Maastrichtian) and have been described from several different localities, including the Tarahumara Formation in northern Mexico (Chacón-Baca et al., 2002) and the Deccan Intertrappean beds and Lameta Formation of India (Ambwani et al., 2003). Diatoms, including exceptionally well-preserved organelles (e.g., internal membranes, lamellate plastid fragments, extracellular mucilage bodies), have been reported from Eocene terrestrial sediments (A. Wolfe et al., 2006) . Because of their elaborate ornamentation and excellent preservation, diatoms are important in biostratig-raphy. They have also been widely used in paleoecology as indicators of past environments. Although the use of molecular data has proved useful in determining the relationships among various groups of extant diatoms, evaluating morphological characters and determining synapomorphies in groups of fossil diatoms have not rapidly moved forward (Williams, 2007). The silicoflagellates comprise a small group of autotrophic marine, planktonic organisms that range from 20 to 50 pm in length and, as the name implies, possess a siliceous skeleton composed of opaline rods fused together to form a network (Preisig, 1994; Desikachary and Prema, 1996). Some classify them with the diatoms. They are first encountered in Early Cretaceous sediments (McCartney et al., 1990), and their peak abundance is reduced in the Cenozoic (Hausmann et al., 2003) so that they are represented by a single family today. Silicoflagellates have not been used extensively as biostratigraphic markers because of the relatively slow rate of evolution within group. Their value as fossils lies in their apparent sensitivity to temperature, and they are useful for biostratigraphy at higher latitudes and in deeper water, where calcareous microfossils are less common, as well as paleoenvironmental indicators. They are potentially useful in the study of paleoclimatology and perhaps in determining productivity levels in ancient ecosystems. Xanthophyceae are most closely related to the Phaeophyceae (Potter et al., 1997). The fossil record of the Xanthophyceae is scanty. One fossil representative is Palaeovaucheria from the one-billion-year-old Lakhanda Formation in Siberia. This fossil alga displays morphological traits characteristic of vauche-rian xanthophytes, including branching at right angles, two sizes of filaments on the same individual, and terminal pores and septae at filament ends (Javaux et al., 2003). Other vauche-rian algae have been reported from middle Neoproterozoic shales in Spitsbergen (Butterfield, 2004, 2007). The brown algae consist of —1500 extant species in more than 250 genera (Norton et al., 1996). Phaeophycean thalli range in size from microscopic uniseriate filaments, for example, in the Ectocarpaceae, to complex plant bodies with significant organ, tissue, and cellular specialization (Graham and Wilcox, 2000). In some species of the giant kelp Macrocystis (Laminariales), the thallus is more than 70 m long. 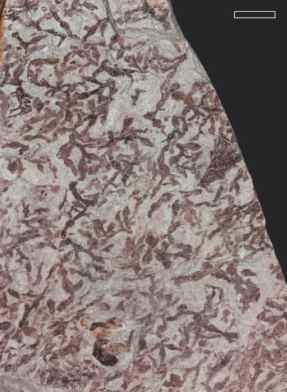 With two exceptions (the genera Newhousia and Padina; Kraft et al., 2004), all brown algae are uncalcified, which has contributed to the absence of a well-defined fossil record for the group. Brown algae have large amounts of the carotenoid fucoxanthin which gives them their characteristic color, and stored food is in the form of lam-inarin. Modern representatives typically inhabit colder waters in the northern hemisphere; in the tropics they occur in large numbers in the Sargasso Sea region of the Atlantic Ocean. One major problem in identifying fossil brown algae is their morphologic similarity to some members of the Rhodophyta. Several of the impression-compression thalloid taxa mentioned in this chapter (Rhodophyta, Chlorophyta) may belong to the brown algae, as Leary (1986) noted in his description of three uncalcified algal impressions from Mississippian strata. One of these, Phascolophyllaphycus , has elongate blades with rounded apices and tapered bases attached to the stipe in a helical arrangement. Several pneu-matocysts, air-filled sacs that are characteristic of the brown algae, occur at the base of the blades; each is — 1 mm in diameter. Cambrian of China (Xu, 2001a). The thallus is composed of ribbonlike, unbranched or occasionally branched blades up to 85 mm long, which bear sporangia. Several algal morphotypes have been described from rocks of Late Ordovician age in Canada (Fry, 1983). The preservation of the carbonaceous specimens and the sedimentol-ogy of the deposits suggest that these algae probably grew in relatively shallow water. Winnipegia has an axis bearing wedge-shaped appendages, each —3.5cm long and lacking surface features. The thousands of specimens encountered in the rocks suggest that the plants were not transported a great distance and were probably buried close to the site in which they grew. 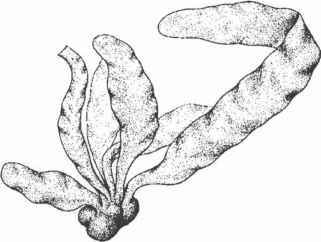 Thalassocystis is a compressed middle Silurian alga that is thought to be either a member of the red or brown algae (Taggart and Parker, 1976). The thallus is branched, with each branch terminating in an inflated bladder about 2.5 cm long. These algae were deposited in a shallow-water marine environment, but the actual habitat of the plants is not known. Another thalloid fossil with possible affinities in the Phaeophyceae is Yeaia africana from the Late Devonian Witpoort Formation in South Africa (Hiller and Gess, 1996), a form that resembles Y. flexuosa from the Upper Silurian Baragwanathia flora (Chapter 8) of central Victoria (Douglas, 1983). The thallus of Y. africana consists of straplike, repeatedly dichotomizing blades that are ornamented with tiny spots. partschii from Romania (Givulescu, 1975) and the Ukraine (Molhanov, 2004).